I’ve been working on this post for weeks. I never do that. I even went back and forth over whether I should tell it, and if so, whether the anniversary of D-Day was the right time to do so. But this story kind of haunts me. I change my mind about it all the time. I try to work it out in my mind, but I can never be certain of what really happened. So now I’ll let you think about it, too. In late June 1998, John, Jacob and I took my Dad, then aged 81, to Normandy, France to visit the D-Day landing beaches, museums, the works. Dad was a WWII vet – he was in the U.S. Navy during the War, stationed on two different aircraft carriers in the Pacific. He fought in some of the big battles in the Pacific, as a gunner on an SBD Dauntless, a seriously cool little plane. But Dad was always fascinated by the D-Day landings. The planning, the strategy. The very real possibility that it could have failed. And he had lost friends there. Two of Dad’s closest childhood friends died there, they’d gone ashore at Omaha Beach. Dad had always wanted to visit Normandy. So when he came to visit us in Switzerland, we took a road trip. 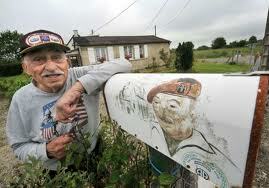 The folks in Normandy, well, they love Americans. We stayed in Sainte-Mère-Église at a lovely farmhouse on the outskirts of town. The owner of the farm treated Dad like royalty, even though he told her he was fighting in the Pacific. The trip was, my Dad said forever afterwards, one of the highlights of his life. Now, you know what happened on D-Day. The invasion began when the Allies sent paratroopers into some of the strategic areas slightly inland from the Normandy Beaches they would invade later on that day, on the morning of June 6th. There were many problems with the drops of these paratroopers. Some of the most dramatic stories came from survivors who dropped into Ste. Mère-Église. You see, that night, June 5/6, there was a fire in the town hall. All the townspeople were out, along with the German occupiers, trying to put out the fire. It spread to several nearby buildings. Into the midst of this chaos, the American paratroopers fell. Many of them were shot by German troops as they dropped, butchered. Others were caught on trees, on buildings –including John Steele. Steele had parachuted into the middle of town, and his parachute was caught on the church steeple. Steele played dead for many hours, with the church bell ringing in his ear, watching many of his fellow paratroopers die. Steele was memorably portrayed by Red Buttons in the movie The Longest Day. There are still parachutes on many of the buildings commemorating the landings. Things changed, the Allies won, the day/night. Ste. 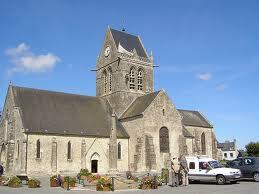 Mère-Église was the first town liberated by the Allies on June 6, 1944. D-Day. It was a vital victory for the Allies, for the French, and really, for the world. John Steele survived and returned to Ste. Mère-Église after the war. He opened up a restaurant that became a huge draw for tourists, including us. Our first night in town, we had reservations. But we were early, and the restaurant wasn’t yet open. So we went to a cafe/bar around the corner to get a drink while we waited for half an hour. John, Dad, Jacob and I sat at a table, excitedly talking about our tour of the town. Ste. Mère-Église is seriously cool. There are still parachutes hanging in trees, on buildings. It is still a real town, but it is also a memorial to the men who fought and died there, and a place that welcomes veterans with affection and gratitude. Unlike much of France, the folks in Normandy truly remember. And they love Americans. So sitting there at the table having a drink, we enthusiastically recounted what we’d seen so far. With two history buffs in the group, Jacob and I learned a lot from John and Dad. Placards explain the events of the night so that it is easily followed. We were all so excited, chatting about the history, explaining more to Jacob. We had seen so much already, and it was only our first night! 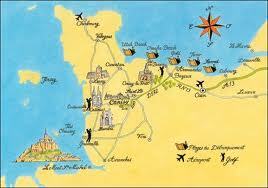 The next day, we would visit the beaches. We were excited. A man standing at the bar behind us was pretty excited too. Quite animated, in fact. But perhaps that was just because he had had three or four drinks too many. “Damn, if I had it to do over again,” blared the drunk American at the bar. He followed it up with a string of obscenities that made my Dad, the sailor, blush. Then the drunk caught sight of me and 7-year-old Jacob. He wandered over to us and offered us his apologies. We politely accepted them. But he didn’t seem to take “no problem” as an answer. He introduced himself as Howard Something-or-other, and stood talking with us about how he had retired to Normandy. “Oh, uhh, wow,” I said, looking skeptically between John and Dad. They didn’t seem to believe the guy either. He continued: “First, I crapped my pants,” he announced, looking straight at my 7-year-old son who was mortified. I was pretty sure we didn’t need to hear that. We didn’t believe a word of it. For one thing, the guy looked way too young. Remember, it was 1998, fifty-four years after the Normandy Invasion. Looking at him, I could see Howard couldn’t then have been more than 60 or 65. That put him in grammar school during the War. Besides, there was just something about him. None of us believed him. Howard was meeting someone, and we had a dinner reservation. So we didn’t pursue his story. But the next day when we went to buy postcards to send back home, well, we saw something rather surprising: A postcard of Howard Manoian. Our Howard from the night before. The drunk. The faker. The guy whose heroic WWII story we didn’t believe, and to which we only listened to a bit of, and then only out of politeness. We felt really stupid at not having tackled the guy and listened to the rest of his story. Peppered him with questions. What a horrible lost opportunity. Imagine, to hear a first-hand account of what happened that night. June 6, 1944. Fast forward to May/June 2009. The Sixty-fifth Anniversary of the Normandy Landings. Even though I hadn’t believed him when he was standing next to me, I was really sad to read the story. Imagine living a lie for all that time. For sixty years. Howard had lived, part-time, in Ste. Mère-Église for decades. He had attended many D-Day ceremonies over those sixty-five years. He had been telling his story, albeit often under the influence, for many, many years. And so I was sad. Yes, the guy had been “a bit of a weirdo” to quote Dad. And yes, he had been rather inebriated. But was he a fraud? Could “Weird Howard” have been living a lie for all those years? If so, how sad, how pitiful. But how could that happen, I wondered, to tell this lie in a place where veterans of D-Day flock? In a place where, I thought, sooner or later, someone would recognize him? In traveling about, and especially visiting many battlefields with John, the history buff, I am often astonished at the images of what soldiers and sailors face in battle. But I have never been anywhere like Normandy. When you stand on the beaches and look up at where the troops had to go, the price of what we often take for granted looms out of the ghosts. The cliffs are high, ragged. With no climbing skills at all, I can’t imagine trying to get to the top, much less with guns pointed and firing in my direction. And yet they did. And many of them died. Many of them were wounded. Many of them are still there, buried at the top of the cliffs, overlooking Omaha Beach. I felt an almost religious appreciation for the Greatest Generation‘s sacrifices. There is no physical place that to me represents the ancient struggle of good versus evil. It is awe-inspiring. And really, it all started in and around Ste. Mère-Église. In researching this post, I found conflicting information about Howard. Some folks say Howard was a fraud. Others, including the French Government believe his story. 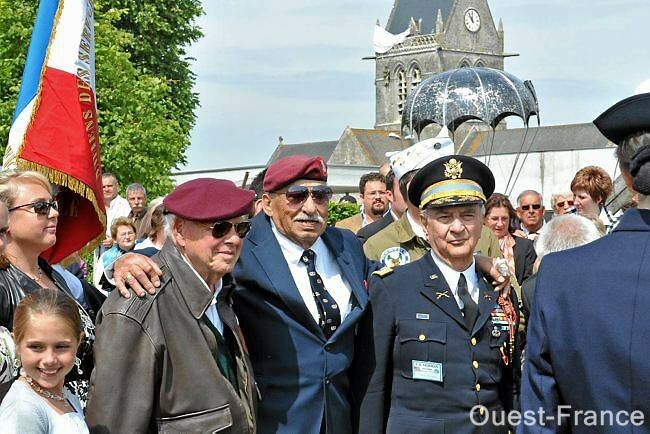 And at the 65th Anniversary of D-Day, in 2009, the French Government awarded Howard their highest medal, the Legion of Honor for exemplary valor and service, even after the Boston Herald article “exposed him” as a fraud. Me, I don’t know what to think. Or maybe I do. I find it hard to believe that anyone could live such a lie for over 60 years and not be exposed much, much earlier. He told his story over and over, like Mr. Bojangles, for drinks and tips. Now you would think that if, in fact, he had gone ashore at Utah Beach, he would still qualify for hero status. Because, you know, the folks that fought there, regardless of in what capacity, division or from which country, well, they are all heroes. They all deserve our thanks. More practically, the likelihood that he would have run into someone who recognized him from that day was pretty high. Folks remember. And folks return. I’m pretty sure at least some would have clear memories of who stood next to them on the landing craft or on a glider soaring silently above Ste. Mère-Église. So in the intervening years, I have thought about Howard quite a bit. I wish we had heard more of his story. I wish, at a minimum, that we had bought him a beer, although he didn’t really need another one. I wish that Howard, who died just last year, didn’t pass with a cloud over his head. If this was a book….I’d say it was quite the page turner. I ignored my hubby calling me to dinner 2x to finish this. Wonderful. Thanks Lorre. I think that it will haunt me forever. But the more I think of it, the more I question why anyone who had come ashore on D-Day on Utah Beach would feel the need to embellish. Somehow, in hindsight, I don’t think he did. Poor Howard. I say: Leave poor Howard alone world. I can’t say I’ve ever heard the story of this gent. I can tell you, though, that I’ve talked to several vets who participated in various military events, and some have felt they didn’t do all they could, even that they messed up because they survived, and their friends didn’t. I’m not sure what to say about the reality of Howard’s story, but I would definitely side with what you said – accept his great gift to us, just for being there on Utah Beach on that fateful day, and leave the veracity of his paratrooper story for nit-picking historians to confirm or deny. My greatest experience went the exact opposite way. We had a campsite set up in the woods of a state park just outside Memphis, perfectly period right down to our bicycles (we were cheap re-enactors, and couldn’t afford tanks and jeeps). Two older gents stopped by, one engaging us in lively chatter, explaining he had grown up during the war but was just too young to serve, though his quiet friend had. (Vital note here – we were portraying German – NOT NAZI – Army soldiers, and the gents were German, right down to the accents.) His quiet friend was unwilling to talk – the twin shame of being German (again, NOT Nazi) and having survived where his friends had died. It took my poor, hapless friend, who had designed and helped “kit-bash” our bicycles, asking the quiet gent what he thought of them, to finally start the story telling. With the exclamation of “those STINKING bicycles”, the quiet gent began retelling his experiences on both Eastern and Western fronts, funny stories intertwining with horrific (he once shot a Russian soldier in the chest, point-blank, with a flare – YIKES! ), and we all came away feeling absolutely wonderful. My motto has always been “The stories belong to the vets – let them tell them or not, the stories are theirs to give to us”. Though I am OBSESSED with the Aleutian campaign, I had to let a vet of that VERY obscure campaign walk away, because he did not want to share. It tore me up inside, but as I said – it was HIS story, to tell or not, as HE wanted. So don’t think too unkindly about old Howard. At worst, he’s a sad, lonely vet, outliving his friends who, as the old phrase goes, “gave all their tomorrows for all our yesterdays”. At best, he is an unrecognised hero, whose story will one day ring out with the full measure of glory so due. Either way, raise a glass to good old Howard. If nothing else, he interests a new generation in the tales and lessons of World War 2. And THAT is the most valiant, and most valuable, battle that we all should seek to wage, everyday. Howard and all his friends deserve nothing less. My, John, you have left me a “compound” comment! Thanks for taking the time to read and to think about my piece. I appreciate it. Your story of the quiet gentleman’s stories was fascinating. As far as the side he fought on, well, that’s often determined by birthplace and geography, isn’t it? As time goes on, I actually think better of Howard. I imagine he exaggerated a bit. But more and more, I can’t understand why someone who came ashore at Utah Beach on D-Day would need to exaggerate! And the fact that he was not “exposed” until most of the witnesses were dead, well, it strikes me as far too coincidental. Thanks, John. You’ve given me more to think about. That cracked me up, Frank, since my husband’s name is also John! I looked at your comment for a split second and said, umm. I responded to John’s last comment thinking it was on my blog (using one of those stupid little Word Press bubbles). So my confusion wasn’t entirely due to my second glass of wine! Have a great weekend Frank! And you too, John! Oh, Lord. I did it again. This is on my blog. Perhaps two is one too many glasses of wine! Thanks for the reminder that I have to get a glass of zinfandel. OK, I give up. You might just as well get me another too, Frank! That makes me feel so much better. Especially now, the morning after! This is some of the best reading I’ve ever experienced on WordPress, and I was captivated by every word of it. I’ve always been in awe of the sacrifices made by the Greatest Generation, and the incredible courage they displayed to fight and defeat the greatest threat ever to modern western civilization. I admire you for getting that across in your writing here, and doing it so effectively. And Howard? He’s a fascinating enigma, and telling his story, true or untrue, made your story all the more interesting. What a nice thing to say, Chris. Thank you. I wasn’t exaggerating when I say that this story haunts me. Sometimes I believe Howard and sometimes I don’t. But the truth is that he was there. Period. And the allegations of fraud only came out 65 years later, when a hefty percentage of the witnesses could no longer comment. So I believe Howard. At the moment. Wow, what a crazy story!! So intriguing! Thanks, Janice. I am delighted to hear that you think I’m a story teller; I always consider myself a rather snarky, short piece writer. These longer, deeper ones are hard for me. I am not a very serious sort! I will go ahead and un-follow you and then re-follow. I will NOT, however, hit “unlike”! Well, you did a great job nonetheless! I think it is mean of WordPress to have an “UNLIKE” option. Someone once “UNLIKED” me and I have yet to get over it! LOL!! Really?? That person was crazy. CRAZY!!! Everyone has their own perspective. Sniff, sniff! Thanks for spending so much time composing this fascinating story. War affects people in so many different ways. I know my Dad didn’t want to even discuss or revisit any of his exploits during WW2. Howard’s story is especially sad and complicated, but thank you for telling it. Thanks, GOF. I think it must be horrible to relive these events. It used to be that folks just wanted to get beyond them. My father would only tell us funny stories about his war years when we were growing up. He was a bit of a practical joker, and was always doing something rather nutty. But the real stories? Those he kept until he met my husband, the history buff, who knew all about the battles my dad had fought in before meeting my dad, apparently through little bits of information that I knew. When they met, Dad opened up and, as we teased, “never shut up” about the war! It was fascinating. What a fascinating experience and story. They truly were the Greatest Generation – those who served, and those who sacrificed at home. Sadly, I don’t think we are that country anymore. Thanks, Peg. I think you’re right, that folks don’t tend to be willing to sacrifice for the common good any more. I have hope that with a threat like we faced during WWII, though, that things would change. Then again, I’m an optimist. I hope Jean likes it, and that she’s doing well now. I felt like I went back in time. So beautifully written with so much heart and pride in our heroes of the past and today. Your dad is an inspiration and so are the people who were part of D-Day. My grandpa from my father’s side was a pilot for the American troops in WW II in the Philippines. He died from a plane crash after the war. Sadly it was not even from a battle but due to a defect in the plane’s engine. Thanks for honoring our heroes and thank you for sharing your family to us. Hi IT, Thanks for your nice comment. I wonder if my dad and your grandpa ever met — they were in the same neighborhood, give or take 1,000 miles! And while I’m not sorry that your grandpa didn’t fall during the war, dying from mechanical failure is terrible. Elyse. I liked this story a lot because it is a really good story and like real life has its mystery about a character’s adventures whose truth probably does lie somewhere in the middle. But even if Howard was lying through his teeth, that’s part of the story (and even more interesting because it begs the question of why), and it is fascinating. Glad you told it. Thanks Eleanor. I’m glad I wrote it, too. And you’re right. Howard may have been a character out of a novel for his story, whatever it was, will be a complete mystery. Although, I think I believe him. Landing at Utah Beach is equally impressive; why lie? What an interesting story. Memory is a funny malleable thing. Thanks for sharing. It was a funny story before the expose came out. I think it is a sad story now. Whichever way things happened, which, as Val pointed out, is probably somewhere in between. Very interesting, and sad. But whether or not his story was embellished, I’m going to remember Howard as a hero. I can understand your feeling of mourning the “missed opportunity to hear more of his story” and that having that memory tarnished by the supposed expose uncovering the alleged fabrications. It feels as if you’ve given Howard a gentle and fair and honorable memory-marker, in the telling of his story. Thanks for sharing. Thanks, 99. I’m glad I wrote this piece. Although I did call him a drunk which is not fair — I have been drunk but am not a drunk. I should have been kinder there. But I do think that Howard was a hero, and probably he exaggerated a bit. Don’t we all try to make a story just a touch better? And isn’t that what storytelling is all about? It just strikes me as so sad that just two years before his death, when he was in failing health, this story broke. It hardly seems fair when so few vets are left to corroborate or refute his story. Thank you for sharing this incredible story, Elyse. I came back to re-read it and it’s stuck with me all morning long. I’m with Val above, I think the truth is probably somewhere in the middle. Regardless of the details, I am in awe of Howard and every other soldier before or since Normandy. I can’t imagine the horror they faced or the fear they experienced. To say there were brave is putting it mildly. I too am leaning towards that middle ground, although perhaps more in Howard’s direction. What I mentioned in my response above (well two of them, actually) kind of convinced me of that. The records say that a soldier, during the most aggressive part of the war — the invasion, was hospitalized in England for four months for a broken finger, well, that just doesn’t jive with reality. And I agree with you on the actions of soldiers. I am often speechless at the thought that they need to act in a way that completely defies logic — “hey, those guys are shooting at us; let’s run TOWARDS THEM! Exactly. There isn’t even a word that I can come up with that defines the bravery they must have when they run directly into combat like that and the horrors they see around them. There are a few good ones, but I don’t think there is a one that captures it all. What a great piece of history Elyse, D-Day was and will likely remain one of those pivotal moments when we look at the sacrifice of a generation and the heroic actions of people and truly believe humanity has greatness within! Your Howard was certainly a character! After reading your description and then reading Stars & Strips and his Obituary, I have a sneaking suspicion the truth lies in the middle. Perhaps he embellished for the tourists, but I suspect it wasn’t fabrication. That was a terrible war (what war isn’t) and our soldiers saw terrible things, Normandy was a particularly horrific battle; so much loss. You did a wonderful job with this! Me? I am going with Howard was a hero, whatever job he had and wherever he might have landed. He served his country with honor and dignity, saw terrible things and still did his duty. The military records were not maintained well and did not reflect his entire service correctly (as continues to be true to this day). I too am leaning towards Howard’s version. As I mentioned in a comment above, the official records state that he was sent to a hospital in England for a broken finger and stayed there for four months. Somehow, ummm, that seems highly unlikely. Howard is the interesting twist in this story – but the most important part remains your tribute to the WW II soldiers. Well done. Thanks, Frank. And thanks for urging me to get this done. The AFrankAngle honorable mention didn’t quite work in the text, though! Elyse, I agree…it really doesn’t matter where he landed, he did his part and gets hero status in my book. I would think that the Boston Herald and the “reporter” should be embarrassed by such splitting of hairs. It’s the job of reporters to investigate, so I don’t fault them, especially. But did they uncover the truth? Who knows. Perfectly timed post and worded brilliantly. I too feel the push and pull of whether to believe the man or not. I think there was much confusion on the day/night of the invasion. Records can easily obtain errors. What is important here is the sacrifice and valor. Impressive! Thanks, Renee. I agree with what you said. The confusion was no doubt responsible for a lot of, well, confusion. One of the discrepancies I found in reading stories about what the records did say was that Howard was wounded — he broke a finger — and was hospitalized in England for four months. Huh? If they hospitalized everybody with a boo-boo for four months, well, I bet things would have turned out differently! Some blog posts make me laugh, some make me think, but few take me on such a journey as you did today. And from a world away. Thanks Elyse. Thanks Ben. I think Howard’s story will always be with me. And of course, I will never know the truth. This is a fantastic blog post, both from a historical perspective (I was an American History major) and from a human perspective. I believe Howard’s story too, but like you said, even if he merely landed on the shores, he constitutes a hero in my book. And though he has passed on, he will live in my heart now, thanks to your work above. Thank you. Thanks, El. It’s such a sad story, either way. I preferred it when I was simply kicking myself for not having believed Howard at the time and thought I missed an unusual opportunity. Good retelling of a unique event. My dad landed at Normandy 6 days after D day, got captured, and was held in the German countryside for six months. The Greatest Gen have some great stories, huh? Absolutely, Les. They are amazing stories. I hope you got to hear them, because, as RescueMe said, many stories have not been told. At least you got good stories from your father. We tried to get my grandfather to share his stories several times growing up, and sadly he took most of it to his grave. One thanksgiving he opened up and told us how he was captured, which was quite a scary story. His company was surrounded, with no way out. So at night his commander told his troops that he was going to surrender in the morning, but if anyone wanted to try to sneak out on their own he wasn’t going to stop them. My grandfather and several of his friends tried to sneak out unsuccessfully, and were caught by the regular army. He was taken as a prisoner, while his commander surrendered to the SS the next morning and promptly executed. Sometimes I think it would have been nice to hear more about the war, but I think in my grandfather’s case it was just to painful for him to talk about. Although painful I think it is important to hear these stories to understand just how horrible war is. You’re right; I think that it is way too painful for many to speak of what they experienced in battle. Growing up, my father only told us funny stories about the war. Things he did while on shore-leave. It was when he met my husband that he started talking, and once he did, well, he kept on. My niece married a military man, and Dad adored him, too. And the stories kept coming. I was mostly in awe, didn’t understand the battles, the significance of what happened and was still delighted to hear his stories. I’ve been thinking about your grandfather’s story all day. Sometimes, in my effort to reply to every comment fairly quickly, I don’t reply as well as I might. But your grandfather’s story is amazing. And it shows just how much life depends on luck, which way one turns, which choice is made. It reminds me of the wonderful Ray Bradbury story, where the man goes back in time and catches (or steps on) a butterfly, and everything is different when he gets back to his own time. It must be terrible for people to remember some of the things they saw. But I’m glad your grandfather told you this story in particular. Because if he hadn’t taken the action he too, well, then, I’m guessing you would not be commenting on this piece or any others. Ya it’s crazy. He also got diptheria as a POW towards the end of the war and probably would not have made it if the war had ended later. He contributes his survival mainly to a cook who was sweet on him and dug deeper in the soup pot for extra potato scraps. He went through periods of being down and wondering why he survived when many of his friends didn’t. On his death bed he apologized for coming back from the war, to which his daughters and grandchildren pointed out that none of us would be there if he hadn’t. Survivors guilt. I wonder which is worse, sometimes. Thanks for sharing your stories. I agree with you, whatever role he played in the war was an important one, and one worth acknowledging. It is sad to think that his esteem might be so low that he desperately sought admiration and applaud from strangers. I would hope in our lives that most of us have loved ones and family that give us all the accolades we need – so that we don’t need to seek them elsewhere – the fact that Howard may not have had this, is the real tragedy I think. Yes, going ashore at Utah Beach on D-Day was a pretty amazing feat. But I still have a hard time believing that he wasn’t telling the truth. I take turns believing him and not believing Howard. Either way, his is a sad story. And it is such a sad story. If he did embellish, there was no reason to. If he was telling the truth, his courage and performance were questioned unfairly. Sad either way. A very intriguing story, a very interesting read. It is a shame that he died and nobody really knows Howard’s story, but I agree I also think it would be hard to carry on with this story for so long if it wasn’t true, and I’m also sure the French Government doesn’t just hand out medals because of a story, there is a lot more to this I feel, but we may never know. A true mystery. I’m sorry Howards story has bothered you all this time. I would say that if he was at Utah beach and did what was necessary,he’s earned the right to tell whatever story he wants. It’s a great story, Elyse, and thank you for sharing it with us. Thanks, Guap. I really wasn’t sure I should tell it. You made me feel so much better, because I really felt I needed to get it out. Thanks. Poor Howard.